(Natural News) The Environmental Protection Agency has been involved in a number of controversies over the years, such as the Gold King Mine spill or their silence on the use of fracking wastewater on farmland. Now, the federal agency is under fire for their collusion with one of the world’s most evil companies: Monsanto. USRTK, a non-profit working for accountability in our nation’s food system, originally uncovered a heart-breaking letter former EPA scientist Marion Copley, who passed away from cancer. 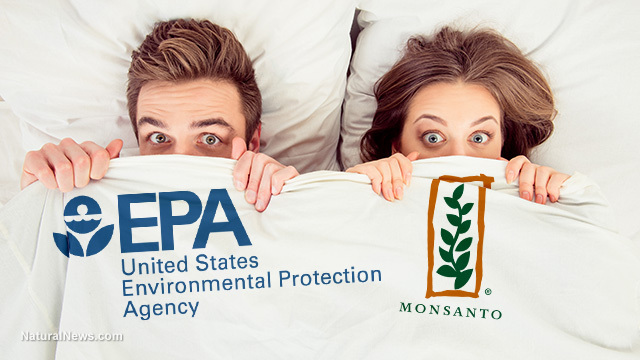 In this letter, Copley begs fellow EPA employee Jess Rowland to protect the public from glyphosate’s toxic nature, rather than continue to cow-tow to Monsanto’s influence. “For once in your life, listen to me and don’t play your political conniving games with the science to favor the registrants. For once do the right thing and don’t make decisions based on how it affects your bonus,” Copley writes. She went on to state that Rowland and another EPA employee, Anna Lowit, intimidated the staff on CARC (Cancer Assessment Review Committee) and altered the MI ARC and IIASPOC final reports to favor the industry. Lowit is still working for the EPA, and Copley’s letter warns that other scientists within the EPA may also be taking bribes. “Your Nebraska colleague took industry funding, he clearly has a conflict of interest. Just promise me not to ever let Anna on the CARC committee, her decisions don’t make rational sense. If anyone in OPP is taking bribes, it is her,” Copley states. In her dying letter, Copley describes a number of mechanisms by which glyphosate could cause cancer. In fact, Copley states that with the evidence she describes, “It is essentially certain that glyphosate causes cancer.” Among the things she describes, Copley notes that glyphosate is genotoxic — a quality she says is essential for cancer formation, and that it induces free radical formation and causes damage to the bacterial populations of the gut. According to Copley, because glyphosate was initially formulated as a chelating agent, it produces many similar effects which can be toxic to humans, suppress the immune system, and cause cancer. Copley couldn’t have been the only person at the EPA to put all the pieces together and see the true toxicity glyphosate possesses — and it’s clear that Monsanto has done their best to obfuscate the facts on their cancer-causing chemical. But will they face punishment for their obvious crimes? Read more stories about glyphosate at Glyphosate.News. Previous :Would you try this new vegetarian burger that “bleeds?” Even if it’s made from GMOs?